Finally, the hot summer has come. It seems as if life can't continue unless staying at air-conditioning room all day long. However, there is the best moment that belongs to hot summer exclusively. It is the cool and fresh air after thunderstorm. The dusts in the air have been cleaned up and the temperature has been lowered down. You can miss such a chance to blend into nature. 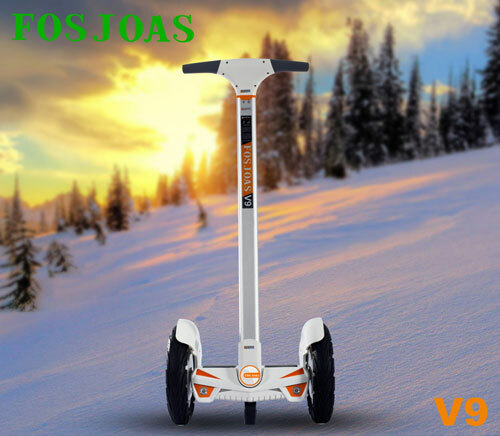 At this moment, Fosjoas V9 self-balancing two wheel electric scooter is the best tool to take you enjoy the freshness and tranquility after thunderstorm. Stand on Fosjoas V9 two-wheeled self-balancing scooter and hold on handlebars. Then, just slightly lean forward and Fosjoas V9 two-wheeled self-balancing scooter will take you to any place you want. The air is so clean and it is very comfortable to breathe it in the nose. It is so cool outside and every inch of skin feels so great. Fosjoas V9 two-wheeled self-balancing scooter has another great function, which is music play function. It is equipped with a closed stereo that offers high-quality music experience. The closed stereo and cell phone can be connected through Bluetooth. Then, it can play the collected songs in the phone. You can wear a pair of earphones and listen to your loved songs. It will be a great enjoyment in summer. Although Fosjoas V9 electric scooter can take you to anywhere, there are still some tips that should be born in mind. First of all, you had better avoid ponding on road so as to protect the built-in lithium-ion battery. Then, there are some muds on roads after thunderstorm. Therefore, after riding, you need to clean Fosjoas V9 two wheel electric scooter. After all, good daily maintenance is helpful to keep high riding efficiency and prolong service life. Until now, will you miss the freshness after thunderstorm next time?